Brief Synopsis – A delusional old man who thinks he’s a knight tries to fight dragon and save his princess with the help of his sidekick Sancho Panza. My Take on it – This is a film that I have been meaning to watch for decades solely due to the fact that I love the title song from this musical. 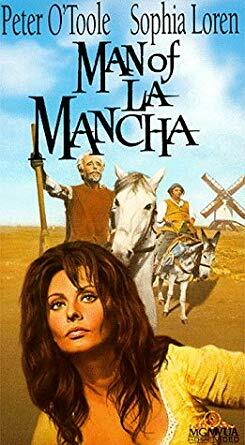 The story of Don Quixote as always fascinated me, but besides getting a crash course about the story via an episode of Quantum Leap, I knew very little about this story. I was so disappointed by this film and am in some ways upset that I finally saw it since it ruined my high expectations of this film and its story. The main song of this musical is still great to listen to, but the rest of the film’s soundtrack doesn’t even come close to matching it despite sounding very similar. The characters of this film are not interesting enough to care about one way or another. Even the fact that Peter O’Toole and Sophia Loren are in this film doesn’t help make it more interesting largely due to the mess of a story that is presented here. The plot meanders along way too much and doesn’t manage to find a way to keep things interesting especially since it’s all presented very haphazardly. The main song is the only reason this film has any merits and it’s easier to find it online than to have to watch this whole film even if Richard Kileyt does a better job than O’Toole manages to do here. Bottom Line – Very disappointing film that I expected to be so much better. The main song is superb and the rest of the music seems like a copy of that main song and don’t manage to add anything to the musical. The characters aren’t interesting enough and even with great actors like O’Toole and Loren, this film is a mess. The story meanders along too much and would be so much better if they had found a way to keep things interesting instead of presenting it so haphazardly.